May | 2015 | VAMboozled! …Said one New York school superintendent, on behalf of 40 other superintendents, and nearly 200 educators and parents, all of whom banded together to denounce New York Governor Andrew Cuomo’s signature Education Transformation Act of 2015. An online petition asking for the bill to be suspended has thus far been signed by almost 4,0000. I also signed, and encourage you to do the same. See prior posts about just this state, and just this Governor, for example, here, here, here, here, here, and here. See the particular article highlighting this particular event here. In an article featured this week in TIME Magazine titled “How Do You Measure a Teacher’s Worth?” author Karen Hunter Quartz – research director at the UCLA Community School and a faculty member in the UCLA Graduate School of Education – describes the legitimately, “new and improved” teacher evaluation system co-constructed by teachers, valued as professionals, in Los Angeles. Below are what I read as the highlights, and also some comments re: the highlights, but please do click here for the full read as this whole article is in line with what many who research teacher evaluation systems support (see, for example, Chapter 8 in my Rethinking Value-Added Models in Education…). 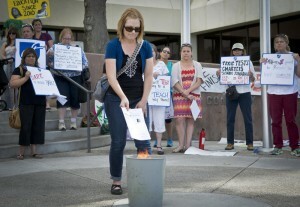 More than three dozen teachers,”including many who [had] just been rated “highly effective” by the New Mexico Public Education Department, working in the Albuquerque Public School District – the largest public school district in the state of New Mexico – turned to a burning bin this week, tossing their state-developed teacher evaluations into the fire in protest in front of district headquarters. See the full article (with picture below) in The Albuquerque Journal here. “An English teacher said he was judged on student progress – in algebra and geometry. With support from New Mexico’s Governor Susana Martinez, New Mexico teacher evaluation systems’ master creator – Education Secretary Hanna Skandera’s – could not be reached for comment. Within the last year, three influential organizations—reflecting researchers, practitioners, and philanthropic sectors—have called for a moratorium on the current use of student test score data for educator evaluations, including the use of value-added models (VAMs). In April of 2014, the American Statistical Association (ASA) released a position statement that was highly skeptical of the use of VAMs for educator evaluation. ASA declared that “Attaching too much importance to a single item of quantitative information is counterproductive—in fact, it can be detrimental to the goal of improving quality.” To be clear, the ASA stopped short of outright condemning the use of VAM for educator evaluation, and declared that its statement was designed to provide guidance, not prescription. Instead, ASA outlined the possibilities and limitations of VAM and called into question how it is currently being (mis)used for educator evaluation. The Gates Foundation is an ardent supporter of fair teacher feedback and evaluation systems that include measures of student gains. We don’t believe student assessments should ever be the sole measure of teaching performance, but evidence of a teacher’s impact on student learning should be part of a balanced evaluation that helps all teachers learn and improve. Applying assessment scores to evaluations before these pieces are developed would be like measuring the speed of a runner based on her time—without knowing how far she ran, what obstacles were in the way, or whether the stopwatch worked! I wonder what the stopwatch symbolizes in the simile: Does the Gates Foundation have questions about the measurement mechanism itself (VAM or another student growth measure), or is Gates simply arguing for more time in order for educators to be “ready” for the race they are expected to run? A decision to use VAMs for teacher evaluations might change the way the tests are viewed and lead to changes in the school environment. For example, more classroom time might be spent on test preparation and on specific content from the test at the exclusion of content that may lead to better long-term learning gains or motivation for students. Certain schools may be hard to staff if there is a perception that it is harder for teachers to achieve good VAM scores when working in them. Over-reliance on VAM scores may foster a competitive environment, discouraging collaboration and efforts to improve the educational system as a whole. We need a pause to replace the current system with a new vision. Policymakers and the public must immediately engage in an open and transparent community decision-making process about the best ways to use test scores and to develop accountability systems that fully support a broader, more accurate definition of college, career, and citizenship readiness that ensures equity and access for all students. 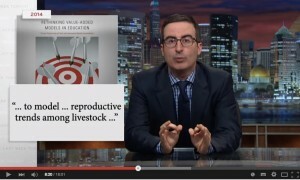 So…are policymakers listening? Are these influential organizations able to amplify the voices of researchers and practitioners across the country who also want a moratorium on misguided teacher accountability practices? Let’s hope so. Lisa Elliott, a National Board Certified Teacher (NBCT) and 18-year veteran teacher who has devoted her 18-year professional career to the Alhambra Elementary School District — a Title I school district (i.e., having at least 40% of the student population from low-income families) located in the Phoenix/Glendale area — expresses in this video how she refuses to be bullied by her district’s misuse of standardized test scores. Yong Zhao — Professor in the Department of Educational Methodology, Policy, and Leadership at the University of Oregon — was a featured speaker at the recent annual conference of the Network for Public Education (NPE). He spoke about “America’s Suicidal Quest for Outcomes,” as in, test-based outcomes. Zhao speaks of democracy, and embraces his freedom of speech in America (v. China) that permits him to speak out. He explains why he pulled his son out of public school, thanks to No Child Left Behind (NCLB), yet he criticizes G. W. Bush for causing his son to (since college graduation) live in his basement. Hence, Zhao’s “readiness” to leave the basement is much more important than any other performance “readiness” measure being written into the plethora of educational policies surrounding “readiness” (e.g., career and college readiness, pre-school readiness). Zhao uses what happened to Easter Island’s Rapa Nui civilization that led to their extinction as an analogy for what may happen to us post Race to the Top, given both sets of people are/were driven by false hopes of the gods raining down on them prosperity, should they successfully compete for success and praise. Like the Rapa Nui built monumental statues in their race to “the top” (literally), the unintended consequences that came about as a result (e.g., the exploitation of their natural resources) destroyed their civilization. Zhao argues the same thing is happening in our country with test scores being the most sought after monuments, again, despite the consequences. Zhao calls for mandatory lists of side effects that come along with standardized testing, similar to something I wrote years ago in an article titled “Buyer, Be Aware: The Value-Added Assessment Model is One Over-the-Counter Product that May Be Detrimental to Your Health.” In this article I pushed for a Federal Drug Administration (FDA) approach to educational research, that would serve as a model to protect the intellectual health of the U.S. A simple approach that legislators and education leaders would have to follow when they passed legislation or educational policies whose benefits and risks are known, or unknown. Otherwise, he calls all educators (and educational policymakers) to continuously ask themselves one question when test scores rise: “What did you give up to achieve this rise in scores.” When you choose something, what do you lose? Do give it a watch! As per the Merriam-Webster dictionary, the word wizardry is defined as something that is “very impressive in a way that seems magical.” It includes the “magical things done by a wizard.” While educational statisticians of all sorts have certainly engaged in statistical wizardry in one form or another, across many states for many years past, especially when it comes to working VAM magic, the set of statistical wizards in the land of enchantment — New Mexico — are at it again (see prior posts about this state here, here, and here). What is highlighted and advanced (as a causal conjecture) is that “the effects” of the state’s teacher evaluations for the academic 2014-15 year, given the state’s evaluation system’s “overhaul” (i.e., on average teachers are now to be evaluated 50% using student test scores, 40% using observational scores, and 10% using other “multiple measures,” including attendance), was the cause of the aforementioned decrease and both increases. But is this really the reality, oh wise one of the dark arts? What is illustrated are New Mexico’s teachers by proportion and by score (i.e., Ineffective to Exemplary) covering the 2013-2014 and 2014-2015 years. More importantly what is evidenced here, though, is yet another growing trend across the country, although New Mexico is one state taking the lead in this regard, especially in terms of publicity. The trend is that instead of having such figures with 99% of teachers being rated as satisfactory or above (see “The Widget Effect” report here), these new and improved teacher evaluation systems are to distribute teachers’ evaluation scores around a normal curve, that is more likely true, whereas many more teachers are to be identified for their ineffectiveness. This can occur, regardless of what is actually happening in terms of actual effectiveness across America’s classrooms, when the purported value that teachers add to or detract from student learning (i.e., 50% of the state’s model) is to substantively count, because VAM output is not calculated in absolute terms, but rather in relative or normative terms. Herein lies the potion to produce the policy results so desired. VAM-based scores can be easily constructed and manufactured by those charged with constructing such figures and graphs, also because tests themselves are also constructed to fit normal curves; hence, it is actually quite easy to distribute such scores around a bell curve, even if the data do not look nearly as clean from the beginning (they never do) and even if these figures do not reflect reality. Regardless, such figures are often used because they give the public easy-to-understand illustrations, that lead to commonsensical perceptions that teachers are not only widely varying in terms of their effectiveness, but also that new and improved evaluation systems are helping to better differentiate and identify teachers in terms of their variation in (in)effectiveness. However, before we accept these figures and the text around them as truth, we must agree that such a normal curve is actually a reflection of reality. We must also question whether for every high performing teacher, we must have another teacher performing equally bad, and vice versa. Generalizing upwards, we must also question whether 50% of all of America’s public school teachers are actually effective as compared to the other 50% who are not. Where some teachers get better, must other teachers get worse? For every one who succeeds must we have one who fails? For those of you who might be familiar, recall the debate surrounding The Bell Curve, as this is precisely what we are witnessing here. By statistical design, in such cases, there will always be some teachers who will appear relatively less effective simply because they fall on the wrong side of the mean, and vice versa, but nothing here (or elsewhere as per similar graphs and figures) is actually a “true” indicator of the teacher’s actual effectiveness. This is yet another assumption that must be kept in check, especially when grand wizards claim that the new teacher evaluation systems they put in place caused such magical moments. A colleague of mine — Stephen Caldas, Professor of Educational Leadership at Manhattanville College, one of the “heavyweights” who recently visited New York to discuss the state’s teacher evaluation system, and who according to Chalkbeat New York, “once called New York’s evaluation system “psychometrically indefensible” — wrote me with a critique of New Yorks’ VAM which I decided to post for you all here. His critique is of the 2013-2014 Growth Model for Educator Evaluation Technical Report, produced by the American Institute for Research (AIR) that, “describes the models used to measure student growth for the purpose of educator evaluation in New York State for the 2013-2014 School Year” (p. 1). I’ve analyzed this tech report, which for many would be a great sedative prior to sleeping. It’s the latest in a series of three reports by AIR paid for by the New York State Education Department. Although the truth of how good the growth models used by AIR really are is buried deep in the report in Table 11 (p. 31) and Table 20 (p. 44), both of which are recreated here. 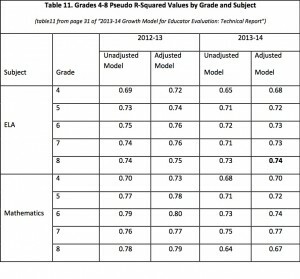 These tables give us indicators of how well the growth models are at predicting growth in current year student English/language arts (ELA) and mathematics (MATH) student scores by grade level and subject (i.e., the dependent variables). At the secondary level, an additional outcome, or dependent variable predicted is the number of Regents Exams a student passed for the first time in the current year. The unadjusted models only included prior academic achievement as predictor variables, and are shown for comparison purposes only. The adjusted models were the models that were actually used by the state to make predictions that fed into teacher and principal effectiveness scores. In additional to using prior student achievement as a predictor, the adjusted prediction models included these additional predictor variables: student and school-level poverty status, student and school-level socio-economic status (SES), student and school-level English language learner (ELL) status, and scores on the New York State English as a Second Language Achievement Test (the NYSESLAT). These tables above report a statistic called “Pseudo R-squared” or just “R-squared,” and this statistic shows us the predictive power of the overall models. 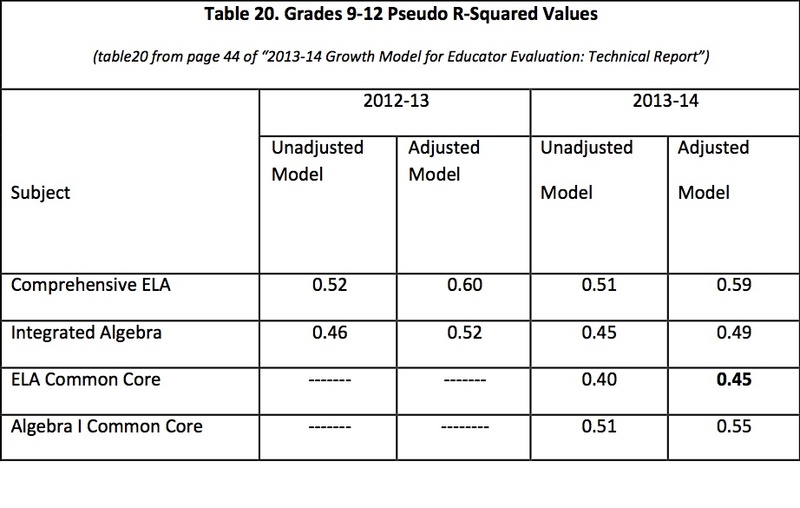 With this knowledge, one can see in the adjusted ELA 8th grade model (Table 11) that the predictor variables altogether explain “74%” of the variance of current year student ELA 8th grade scores (R-squared = 0.74). Conversely, this same model has a 26% of error (and this is one of the best ones illustrated in the report). In other words, this particular prediction model cannot account for 26% of the cause of current ELA 8th grade scores, “all other things considered” (i.e., the predictor variables that are so highly correlated with test scores in the first place). The prediction models at the secondary level are much, MUCH worse. 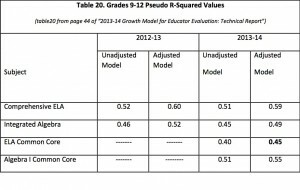 If one is to look at Table 20, one would see that in the worst model (adjusted ELA Common Core ) the predictor variables together only explain 45% of student ELA Common Core test scores. Thus, this prediction model cannot account for 55% of the causes of these scores!! While not terrible R-squared values for social science research, these are horrific values for a model used to make individual level predictions at the teacher or school level with any degree of precision. Quite frankly, they simply cannot be precise given these huge quantities of error. The chances that these models would precisely (with no error) predict a teacher’s or school’s ACTUAL student test scores is slim to none. Yet, the results of these imprecise growth models can contribute up to 40% of a teacher’s effectiveness rating. This kind of information on all the prediction error in these growth models needs to be in an executive summary in front of these technical reports. The interpretation of this error should be in PLAIN LANGUAGE for the tax payers who foot the bill for these reports, the policy makers who need to understand the findings in these reports, and the educators who suffer the consequences of such imprecision in measurement. As per an article in Capitol Confidential, two weeks ago New York’s Governor Cuomo – the source of many posts, especially lately (see, for example, here, here, here, here, and here) — was questioned about the school districts that throughout New York were requesting delays in implementing the state’s new teacher evaluation program. Cuomo was also questioned about students in his state who were opting out of the state’s tests. Yet the tests are to be used to evaluate how effective New York’s teachers are? So, the tests are meaningless to students throughout the state, but the state is to use them to evaluate the effectiveness of students’ teachers throughout the state regardless? The tests won’t count for measuring student knowledge (ostensibly what the tests are designed to measure) but they will be used to evaluate teachers (which the tests were not designed to measure)? In fact, the tests as per Cuomo, “won’t count at all for the students…for at least the next five years.” Hence, students “can opt out if they want to.” Inversely, if a student decides to take the test the student should consider it “practice” because, again, “the score doesn’t count.” Nor will it count for some time. This all brings into light the rarely questioned assumption about how the gains that students make on “meaningless” tests actually indicate how much “value” a teacher “adds” to or detracts from his/her students. What is interesting to point out here is that with No Child Left Behind (NCLB), Governor turned President George W. Bush’s brainchild, the focus was entirely on student-level accountability (i.e., a student must pass a certain test or face the consequences). The goal was that 100% of America’s public school students would be academically proficient in reading and mathematics by 2014 – yes, last year. When that clearly did not work as politically intended, the focus changed to teacher accountability — thanks to President Obama, his U.S. Secretary of Education Arne Duncan, and their 2009 Race to the Top competition. Approximately $4.35 billion in taxpayer revenues later, we now have educational policies focused on teacher, but no longer student accountability, with similar results (or the lack thereof). While VAMs certainly have a number of serious issues with which we must contend, this is another that is not often mentioned, made transparent, or discussed. But the reality is that teachers across the country are living out this reality, in practice, every time they prepare their students for these tests. So I suppose, within the insanity, we have Cuomo to thank for his comments here, as these alone make yet another reality behind VAMs all too apparent. My book on “Rethinking Value-Added Models…” was featured last night, on HBO’s Last Week Tonight with John Oliver. Perhaps more importantly, though [insert smiley face emoji here], is the 18 minute series in which the book is mentioned (at the 8:20 point) — all about Standardized Testing. Click on the YouTube video below to watch the whole show. This 18 minutes includes information on the educational policies supporting the history of high-stakes standardized tests in the U.S., how educational policymakers (including U.S. Presidents G.W. Bush and Obama) have unwaveringly “advanced” this history, how our nation’s over-reliance on such test-based policies have done nothing for our nation for the past ten years (as cited in this clip, even though they have really done little to nothing for now more than 30 years), how and why the opt-out movement is still sweeping the nation, and the like. Also prominent is Florida Teacher Luke Flint’s “Story” about his VAM Scores (also covered here). This is a must watch, and funny!! Funny as it can be, of course, given the currently serious situation. The video’s content is a bit, let’s say edgy too though, so please be advised.